Lipogaine offers both topical solution and shampoo. Their side effects are listed below separatedly. Lipogaine topical solution has both Lipogaine for men and Lipogaine for Women. The most common Lipogaine topical solution side effects is scalp irritation such as itchy scalp in the treated area due to propylene glycol. The occurrence should be less than that from other minoxidil products as Lipogaine has less amount of propylene glycol. It is estimated that less than 2% users may have the scalp irritation issue. Lipogaine also offers a propylene glycol free version for both men and women. They are Lipogaine for Men for sensitive scalp (the image above) and Lipogaien for women for sensitive scalp. Some female users may grow too much hair on the unwanted area such as on the face. The hair grown in the unwanted area will fall off after stoping use Lipogaine topical solutions. In rare situations (<1%), some people may develop rashes on the scalp, face or on the other part of the body. You will need to stop using the product immediately if this happens. All of these side effects are said to be reversible according to clinical study results, which means if you stop using Lipogaine products, the side effect should go away. Also, none of these side effects is unique to Lipogaine products. They are side effects of any minoxidil products. 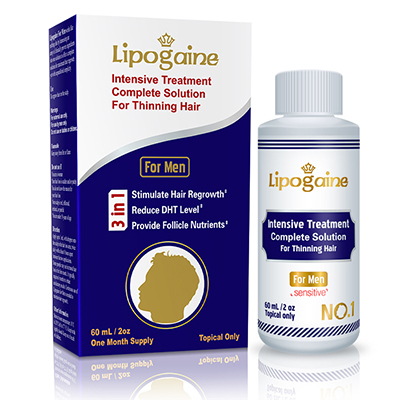 One should expect much less scalp irritation from Lipogaine topical solutions compared to other minoxidil products. Lipogaine big 3 shampoo and big 5 shampoo are natural ingredients based shampoo. It is essentially free any of any side effects.